Marshes, swales, wet fields, shores, fens, conifer swamps, thickets, moist clearings, river and stream banks. 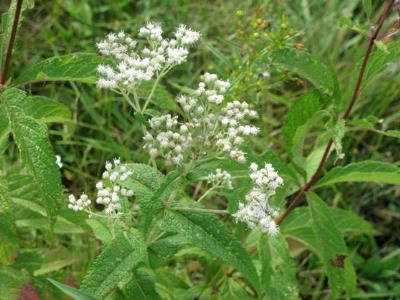 Ordinarily a very easily recognized species with its connate pairs of leaves, abundant crinkly septate hairs, and white heads, but quite variable in robustness and other features. Very rarely a plant will have at least several upper pairs of leaves merely sessile and truncate at the base, but not connate [f. truncatum (A. Gray) Fassett], and the flowers are rarely pink-tipped [f. purpureum Britton]. A plant from Cass Co. (Rogers 13011, WUD) with leaves ± tapered to a sessile base and achenes shriveled could be a hybrid with E. serotinum [E. ×polyneuron (F. J. Herm.) Wunderlin]; it was apparently growing with the putative parents. MICHIGAN FLORA ONLINE. A. A. Reznicek, E. G. Voss, & B. S. Walters. February 2011. University of Michigan. Web. 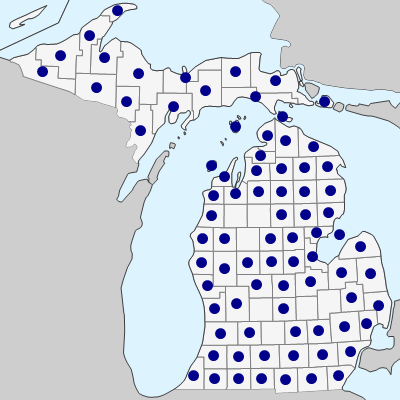 April 19, 2019. https://michiganflora.net/species.aspx?id=322.